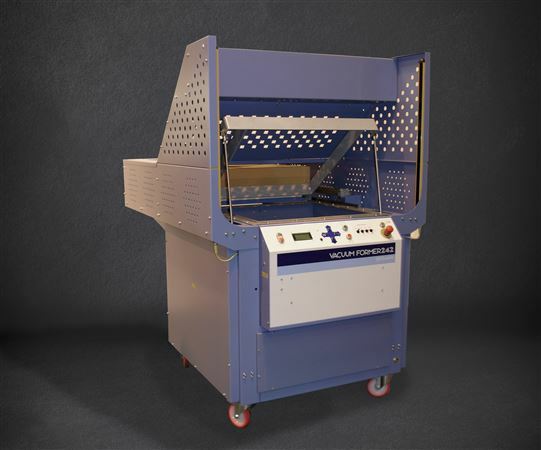 Our range of vacuum forming machines has been developed for high performance and low maintenance. The CR Clarke CR242 has a maximum sheet size of 686 x 660mm, and a maximum mold height of 300mm. The machine is fitted with a 15 zone ceramic heater system for fast and uniform heating of the most demanding materials. The sealed lubrication rotary vane vacuum pump ensures quick evacuation and excellent molding definition, and all seals are produced from high temperature silicone for longevity. The platen, heater hood and clamp frame are pneumatically operated, with light curtain guarding ensuring operator safety. The machine is controlled via a panel mounted color touchscreen, and can be run in full load-to-unload automatic mode. For setting up and small batches, panel switches allow the machine to be used manually. The control system of the CR242 incorporates a sheet leveling system to improve heating consistency, and cooling fans to speed part cooling. The control also has selectable heating time control strategies, which can improve part consistency through a production batch.